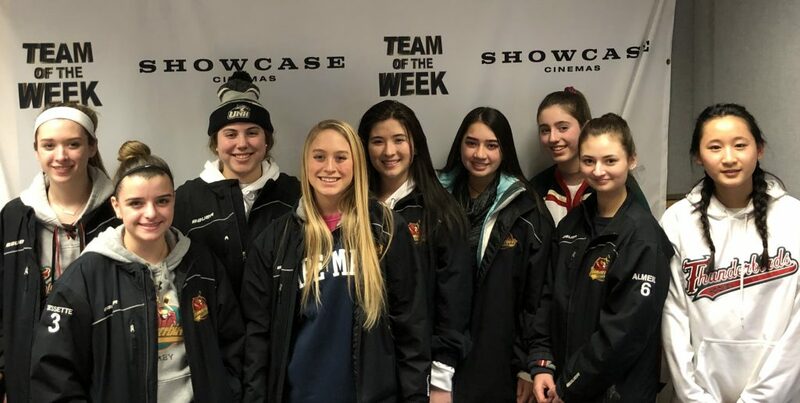 Congratulations to this week’s Showcase Cinemas High School Team of the Week: East Greenwich Girls Ice Hockey! We are the Cranston East & West- East Greenwich High School girls hockey team. All of last year and prior years we struggled to earn a victory and get a skilled team together, but this year we have a lot of talent our way. Every year we work hard to go from hardly able to skate to a functioning team and lines. We have many skilled players though, that help out and teach the newer players to learn, and these skilled players are the captains who have been playing hockey ever since they were young. This year we volunteered our time at Toys for Tots and helped with donations at the Thirsty Bever in Cranston. Although we are not the most highly skilled team, we have almost every year earned the sportsmanship award for consistent effort and teamwork on and off the ice by the RIIL!